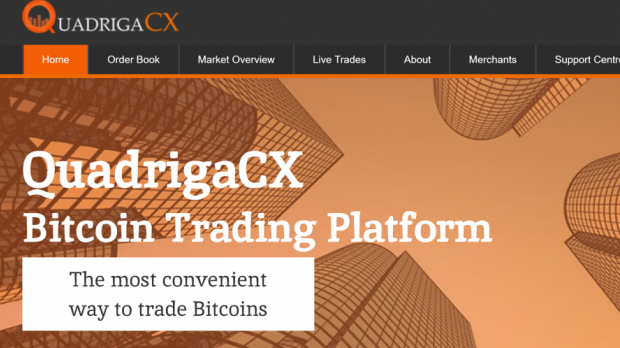 QuadrigaCX was Canada's largest crypto exchange. A Canadian cryptocurrency exchange has locked its users out of an estimated €120 million worth in funds after its founder died, apparently taking his encryption password with him. QuadrigaCX says it has been unable to access its funds following the death of founder Gerald Cotton, 30, late last year. Mr Cotton died suddenly and without warning while in India. “Quadriga’s inventory of cryptocurrency has become unavailable and some of it may be lost,” Mr Cotton’s widow, Jennifer Robertson wrote in an affidavit filed in Nova Scotia, Coindesk reported. His widow said that the laptop which her late husband used to carry out the company’s business “is encrypted and I do not know the password or recovery key". "Despite repeated and diligent searches, I have not been able to find them written down anywhere," she added. Cryptocurrency exchanges generally operate using a system of ‘hot’ and ‘cold’ storage, with a limited number of funds kept accessible in ‘hot’ wallets, where they can be traded, and the majority stored in ‘cold’ storage for safekeeping. According to Ms Robertson, her late husband had sole responsibility for moving crytocurrencies on the exchange, and remaining team members have no way of accessing the exchange’s cold wallets. QuadrigaCX has hired a private investigator to try and track down the missing password or retrieve funds, but has so far been unsuccessful. According to the court filing, QuadrigaCX has around 115,000 users with cryptocurrency balances. It holds around CAD$70m (€47m) in fiat – traditional – money and a further CAD$180 (€120m) in cryptocurrencies.